The music of Azerbaijani composer Kara Karayev will not test your patience unless you are irritated or stupefied by things that are easy to assimilate. Karayev was born in Baku and studied with Shostakovich. With Akhmet Hajiyev he wrote a well received opera Fatherland in 1945. Karayev played a leading role in the musical life of Azerbaijan but his later years were spent in Moscow, driven there by ill health. The Seven Beauties is a ballet, here represented in its usual format as a 12-movement suite. Karayev at first seems intent on peopling this score with the sort of over the top gaudy colour (tr. 1, 0.40) found in Khachaturian's Masquerade and in Basil Poledouris's Conan scores. That said there's far more in the way of the most sensational yet delicately presented melodies typical of the Russian nationalists of a generation earlier. The writing also has a filmic sentimental romance (Adagio tr. 2, Slavonic Beauty tr. 8 and The Most Beautiful tr. 11) where any tendency to sickliness is offset by Azeri folk influences. The Adagio is desert island material - one for the heritage tracks. Karayev is a master of lucid orchestration one aspect of which lies in his skill at matching his often indelibly good ideas with the perfect instrumentation. His exotically colourful Chinese Beauty movement parallels the writing in Glière's ballet The Red Poppy. If there's the influence of Boléro to contend with in the final Procession it's a small price to pay for music that has learnt more than a little from the brilliance and finely spun strengths of Rimsky-Korsakov. From eleven years later comes the Don Quixote 'Symphonic Engravings' (a first-class title). This eight-movement suite comprises Travels, Sancho, the Governor, Travels, Aldonse, Travels, Pavan, Cavalcade and Don Quixote's Death. The music is again easy of access and is often gentle, miraculously and lyrically so. The finale is genuinely touching. This score can also be variously redolent of Rózsa's film music (or vice versa), Kódaly's Háry Janós and Waxman's Ride to Dubno. There's some scorching trumpet writing worthy of Timofei Dokshizer, that Russian master trumpeter. We are long past time for a multi-CD edition for Dokshizer. The repeated Travels movements bid fair to stand as an echo of the Promenade interludes in Pictures from an Exhibition. They have an indomitable trudging pattern with a Shostakovich-like cutting edge. The symphonic poem Leyla and Mejnun is the earliest work here. A continuous span of lyrical music running to just over a quarter of an hour, it once again has a soft-cored cinematic aspect and would work well alongside Nino Rota's music for Zeffirelli's Romeo and Juliet film (review review). The legend on which this work is based also inspired operas from Uzeyir Hajibeyov in 1908 and from Gliere in 1940. Alan Hovhaness's Symphony No. 24 (1973) is the Majnun Symphony. 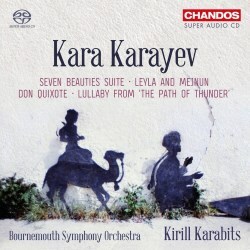 The feathery Lullaby from Karayev's ballet The Path of Thunder, lulls and nods in Karayev's sensitive Delian cradling. Although you will have to face up to duplication there are other Karayev discs out there. His Third Symphony is on Naxos with Leyla and Quixote. The same label has another disc of the suites from The Seven Beauties and the full Path of Thunder. Likewise from Russian forces on Delos. The somewhat tougher Violin Concerto can be heard on a Russian Revelation CD from the late 1990s. If you can find it a wider conspectus of Azerbaijani music can be found on a 6-CD boxed set. However, if you are intent on investigating another tuneful Azerbaijani composer then try Fikret Amirov. Kirill Karabits has chosen well here from among Azerbaijan's musical patrimony. We should also be open to being lead by him towards the Ukraine's most impressive neglected symphonies. I am glad to see that Lyatoshinsky's Third is in this year's BSO season but I hope he will not stop there. Andrew Walton and Ben Connellan have produced a sound that is both silky and forward and the extensive notes by Andrew Burn seem well calibrated and encouraging. Karayev receives the elite treatment in the hands of Chandos and with this premium disc makes a confident step beyond the unknown region.